Please bring your favorite festive Christmas Dish to share! 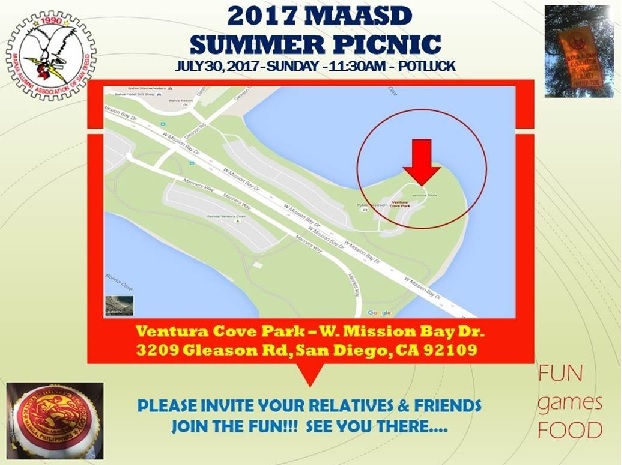 Reminder: MAASD meeting at my place Saturday April 30th starts at noon. 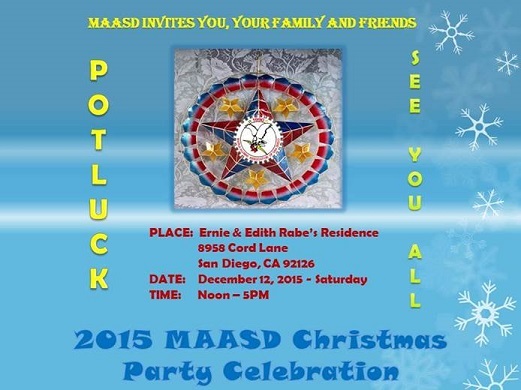 Potluck meeting so please bring your favorite dish. I wish everyone had a wonderful, blessed Christmas and a joyful New Year! Our dreams, hopes, expectations are soaring as we begin the year 2011. We thank our Lord for his continous blessings to our alumni association. Since the formation by small group of fellow alumni in 1990 and 20 years later, our alumni association remains solid and strong. I thank everyone, fellow Mapuans, families and friends, for your never-ending support, dedication, and camaraderie. 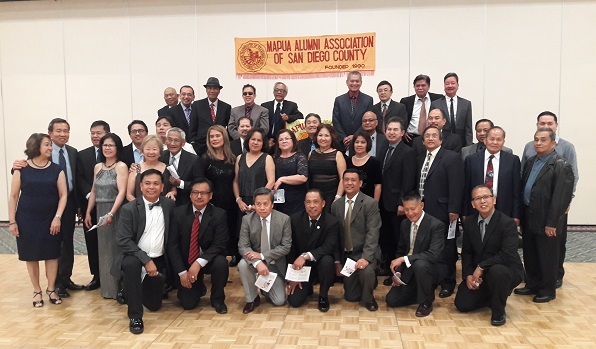 This year 2011 marks the beginning of new leadership by Joy Gacuya (2011-2012 Chairman) for our Mapua Alumni Association of San Diego. I am very proud of Joy for graciously accepting this role. I am very confident that with your support, Joy will lead us to where you wanted our alumni association to be successful. We will have our potluck meeting on January 29th Saturday 12:00 Noon at our home 11406 Heartwood Court San Diego CA 92131. As usual please bring your specialty dish. Congratulations to Joy Gacuya, incoming President / Chairman, and all the officers shown on the list below. We will hold a potluck meeting to discuss and plan for our forthcoming activities, such as Christmas Party, Caroling, Induction of Officers, others. It is scheduled on October 24th 2010 Sunday 12:00 Noon at our home: 11406 Heartwood Court San Diego CA 92131. As usual please bring your specialty dish. Our Condolences... Please Pray for the Souls? If you are in town, come join us for a Memorial Weekend gathering. Casual walk and grill May 30th Sunday 3:00 PM. 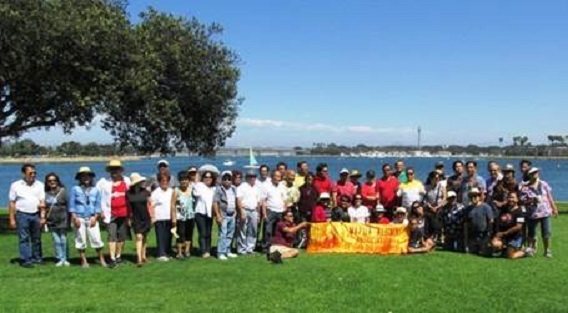 Roy and Jo Villa have graciously offered their reserved gazebo at Hill Top Community Park, Rancho Penasquitos (same place where we had our Walk for the Mapua Scholar), as they will be throwing a send-off party for his son and friends who is joining the NAVY. 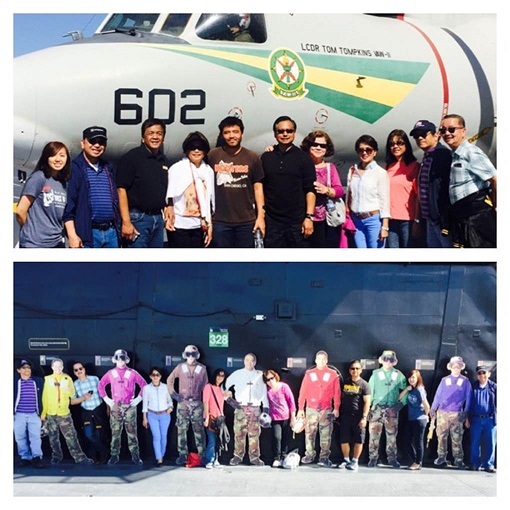 Let us join Roy and Jo in wishing their son a safe trip and a successful military NAVY career! Note: Please bring your picnic chairs and a dish to share. See you all there. Mapua friends and families are welcome. 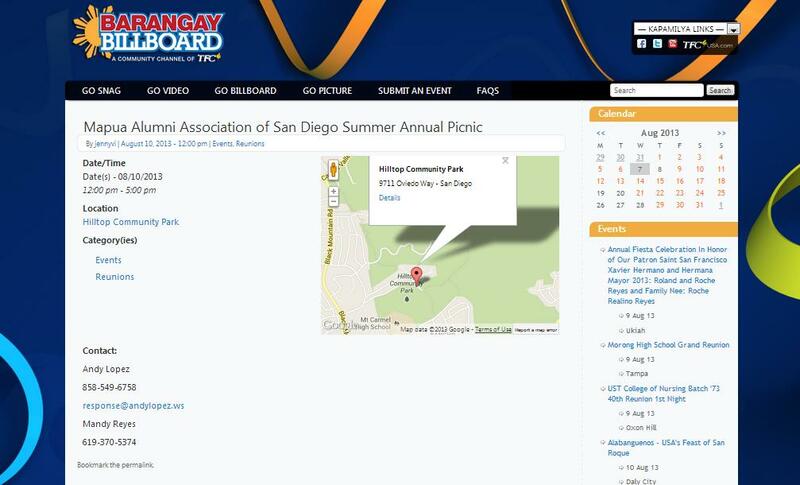 Hilltop Community Park in Penasquitos San Diego California. 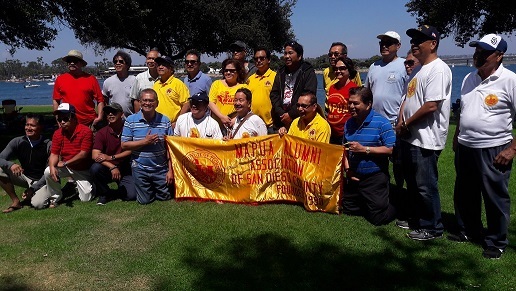 "Walk for the Mapua Scholar"
You are all invited to our First "Walk for the Mapua Scholar"
Fund Raising Event on April 24th Saturday 3:00 PM at Hilltop Community Park in Penasquitos San Diego California. Yes, we are holding a Potluck Meeting April 3rd at 1:00 PM (Pre-Easter). Please bring your favorite dish to share. Meeting Place: For directions 11406 Heartwood Court, San Diego CA 92131. 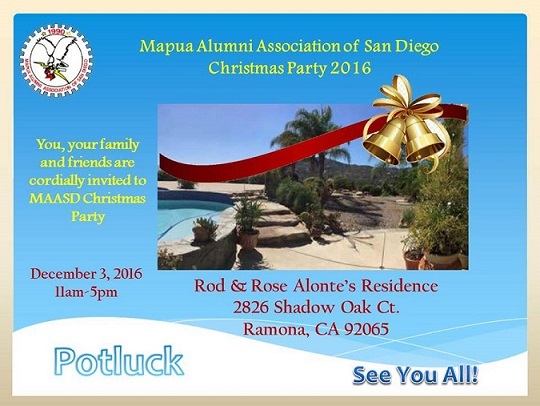 Just a reminder... Our Christmas Potluck Party is already this coming Saturday. We look forward to see everyone. Also, as suggested from last Friday's potluck caroling practice, in lieu of our traditional exchange gifts, we can still have some fun. We will have an equivalent "exchange gift" fun with no financial burden. Each member or family will bring a Christmas ornament(s) which you may find from your home to share. Should you plan to purchase one, a maximum of five dollars Christmas ornament decor is ideal for a gift to share. It can either be wrapped or unwrapped. Note: This is optional and not mandatory. We will be visiting the "seniors or elderly" and will be singing Christmas carols with an intention of lightening up their spirit. If you know someone who you would like to schedule a visit, please email Rod Alonte rodsie@cox.net or Veny Manuel nebven2513@san.rr.com. Note: This is not a fundraising event. Thank you everyone for your time in today's community service (special mention to Lucille and Matt Malig, Brenda and Egay Inocentes, Ben and Veny Manuel, Rod Alonte, Larry Pascual, Andy Lopez and Ernie Barlahan). It is another great experience of giving back to our community. There has been some suggestions to schedule volunteer services to at least 2 or 3 times a year, instead of our annual commitment. I understand there are more volunteers who wanted to come, but it can only accommodate 12 volunteers max. We can make this plan happen through our willing coordinators and committed volunteers. We will plan for next meeting. 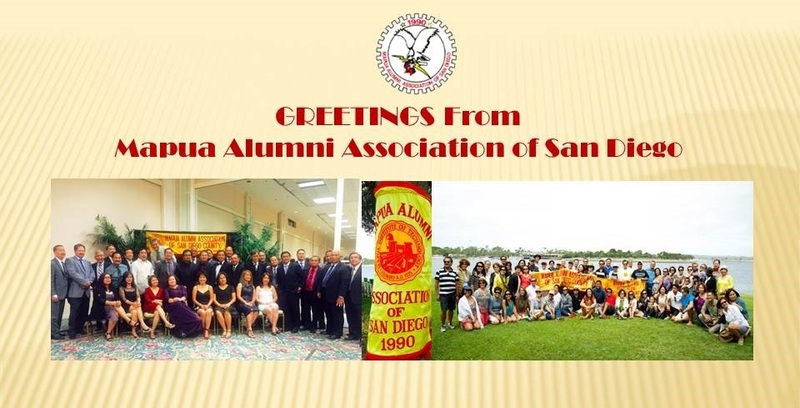 The Mapua Alumni Association San Diego is scheduled to serve lunch at Saint Vincent de Paul on Saturday, October 24, 2009 from 10:30 a.m. to 1:00 pm. For your information, the facility requires volunteers to wear long pants, sleeved shirts, closed toe shoes and a hat. We are also required to take a 5-question “Food Handler Test”. 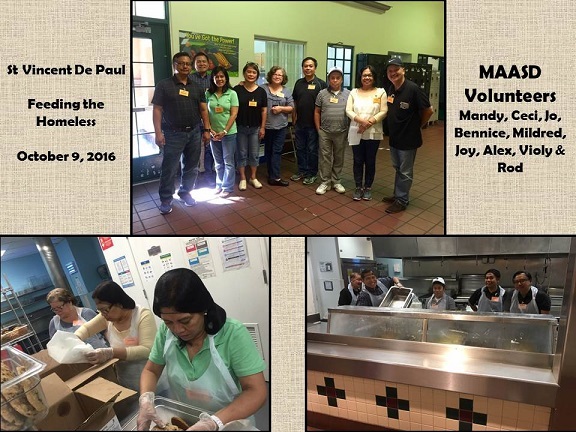 Thank you for participating in this opportunity to serve the needy at Saint Vincent de Paul, 505 16th St, San Diego, CA 92101 Directions. Please do not hesitate to email or call us if you have any questions. Please email or call us if you have any question. Thanks. Hi! All, Hope everyone is well! 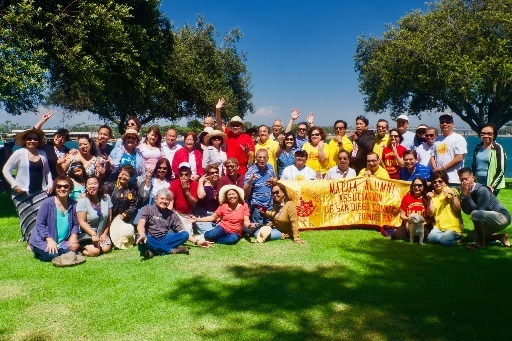 Our first potluck/meeting for 2009 is scheduled on January 10th / Saturday 3 PM at Frank/Tusa Enriquez' home (11406 Heartwood Court San Diego CA 92131). Our primary agenda is the Dinner & Dance / Induction of Officers. Please note that the ballroom at Barona Valley Resort has already been reserved by Sally Jabinal for March 28th Saturday, along with our DJ - Vic and Annie. Please mark your calendar for your attendance of this event. In behalf of MAASD, we would like to acknowledge and thank our members and friends for their support and donation to the scholarship fund. Glad to anounce that for the month of December we have received a total of $$$$ of donation. Christmas caroling host families: Oscar Enriquez; Ernie & Edith Rabe; Rollie and Lyn Munoz; Beda and Marlyn Galleta; Pete and Fely Vicencio. Donation received from the mail: Ed and Precy Dizon; Nora Samia; Lito and Tess Ramirez; Pipo and Lorie Buencamino; Les & Claire Morosi. Donation from Plant Sale: Oscar and Vera Garcia. Donation received in January (will be included on the next report): Benny and Nancy Valerio; Fidel and Emilia Ringpis. Again, thank you for your continued support. 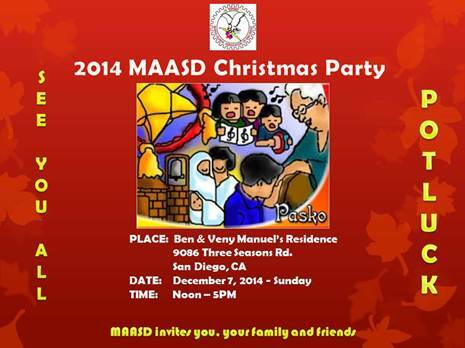 Friday Caroling 5:00 PM assembly at Ben & Veny's Residence 9086 Three Seasons Rd, San Diego, CA 92126. 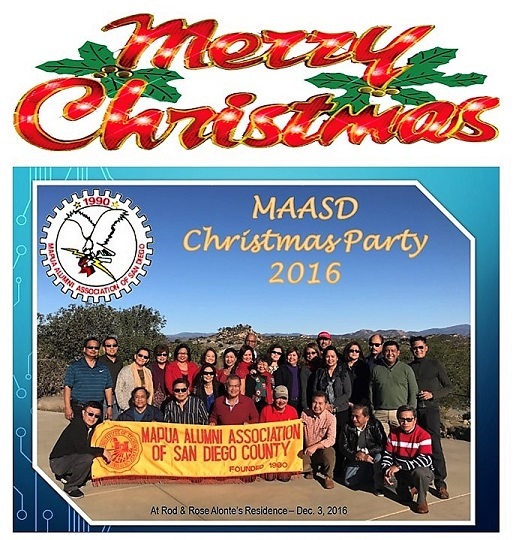 Subject: MAASD Christmas Potluck Party - Thank You Everyone! We have another successful Christmas Potluck Party! 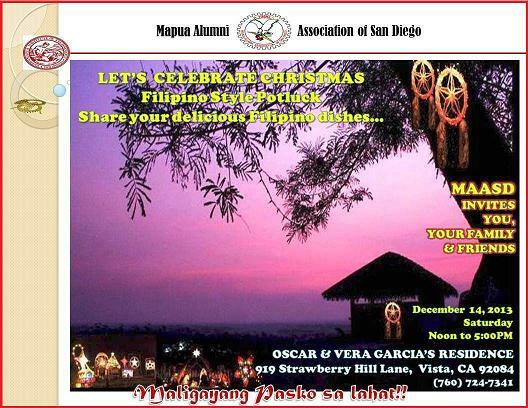 This is mainly due to the excellent hospitality and generosity of our fellow Mapuan Oscar Garcia and wife Vera! On top of sumptuous foods shared by everyone, (Mang) Oscar had plants (giant bayabas, atis, bananas, mangoes, etc) prepared for great bargain prices. A total amount of $93.00 from the plant sale proceeds was donated by Oscar for our Scholarship Fund. 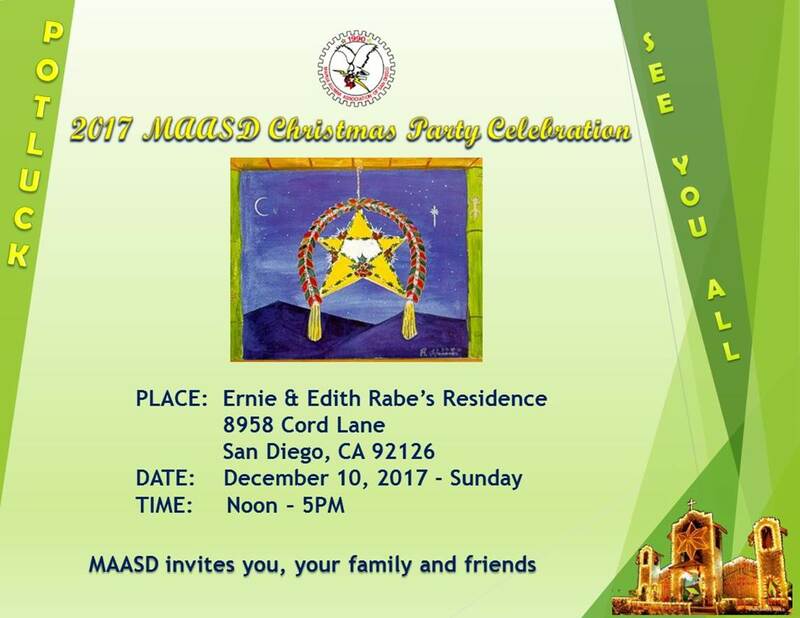 Please stay tuned on our next MAASD Christmas Caroling which shall be held on Friday, December 12th 2008(North) and Saturday, December 13th 2008 (South) San Diego. It is not too late to join the choir or be the host family! Thanks everyone! We wish you all a Merry Christmas and a Joyful New Year! 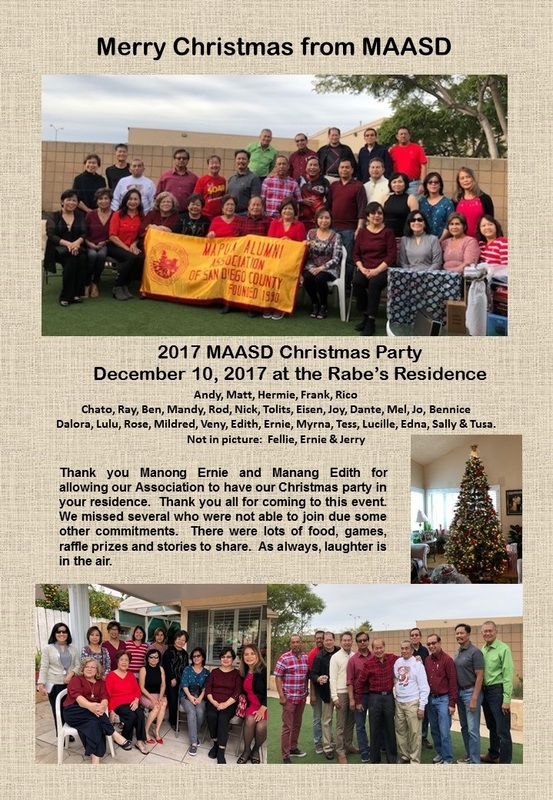 MAASD Christmas Potluck Party. 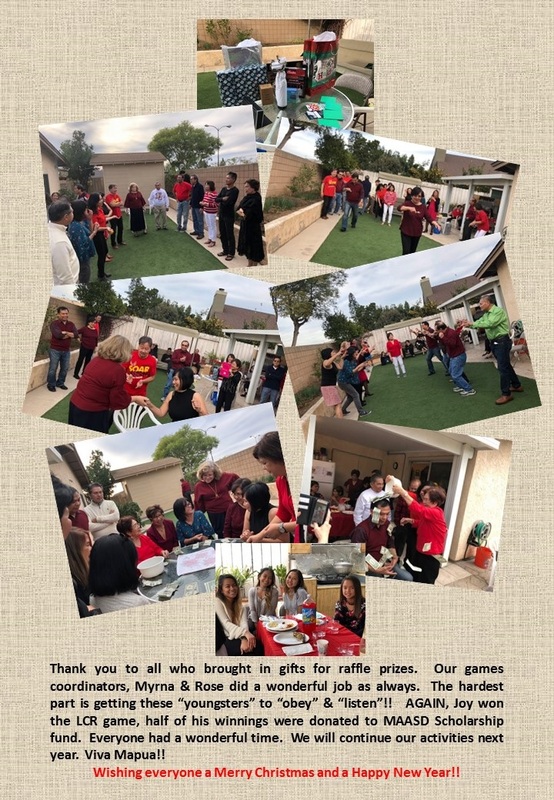 December 6th 2008, Saturday 11:00 AM - 5:00 PM at Oscar and Vera Garcia's residence 919 Strawberry Hill Ln, Vista CA 92084. FWY 15, Exit Gopher Canyon Road (West), left on East Vista Way, right on Strawberry Hill Lane, 4th house on the left is #919 Strawberry Hill Lane. 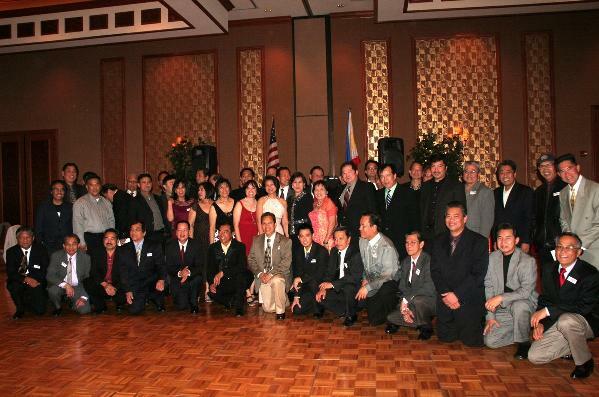 Email: ilovebayabas@gmail.com Phone (760) 724-7341 Home 760-415-8372 Cell. MAASD Scholarship Fundraising Event. November 23, 2008 Sunday Barona Casino Trip. Thank you for coming and your support! Friday November 7th 2008 6 PM at Ben and Veny Manuel's residence at 9086 Three Seasons Rd., San Diego, CA 92126. Happy Birthday... Matt Malig, Veny Manuel, Andy Lopez, Rose Alonte, Nida Laforteza! What happened in 2004, 2005, 2006, 2007, 2008? An alumnus of Mapúa Institute of Technology, was creating the sculpture that won a Metrobank Art & Design Excellence (MADE), he was admittedly upset. With no concept in mind and just his emotions guiding his hands, he mindlessly weaved together the bamboo toothpicks he found in his backyard. 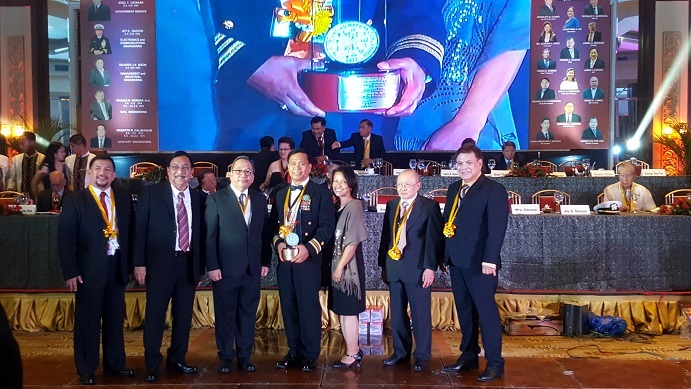 The 2008 architecture graduate of Mapúa, a Mapua Alumni Association of San Diego scholar. 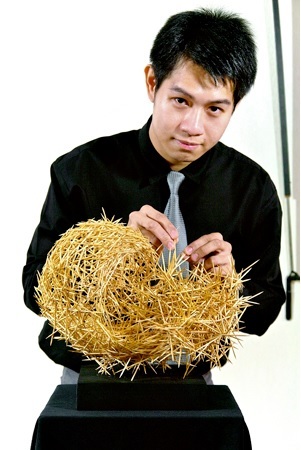 His winning piece, titled “Walang Pinanghahawakang Anuman Sa Palad,” was unanimously proclaimed the grand winner in MADE’s Sculpture category because of its originality, beating 23 other finalists. 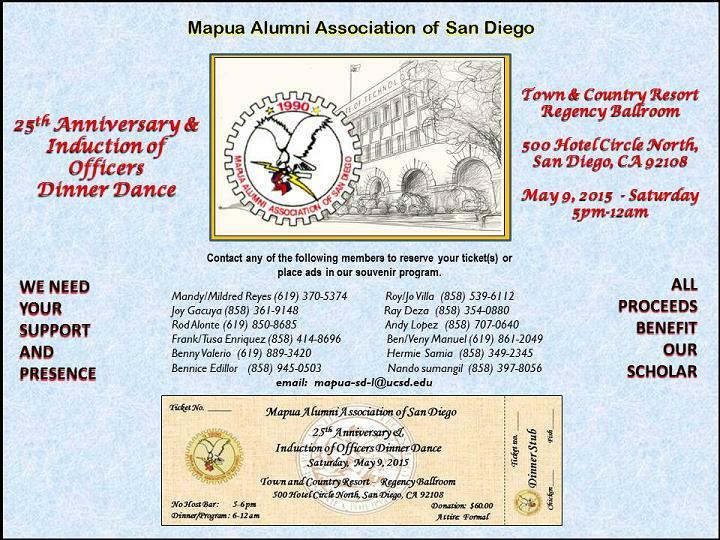 The MAASD Induction of Officers’ Dinner Dance is this coming Saturday April 13, 2013. So far, there were 111 confirmed attendees as reported last Sunday’s meeting. There’s still work to do but with everyone’s help we should be ready to have fun. 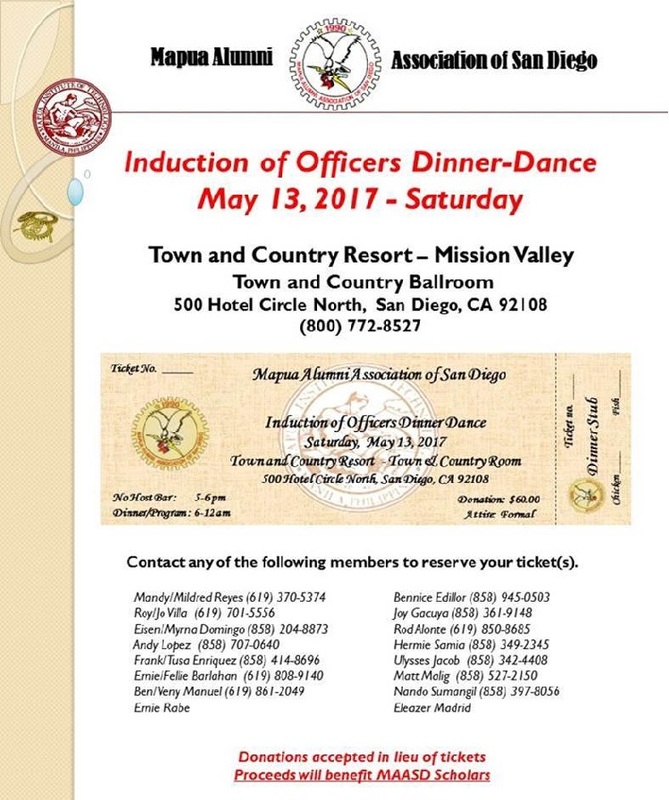 Just a reminder that there will be 2 events in MCAS - Miramar Officer's Club and our MAASD Dinner-Dance will be in the right banquet room. Guests without military sticker are advised to have their Driver's License, Insurance and Car Registration ready upon entering the MCAS gate. Call Joy Gacuya at (858) 361-9148 if you are having problems at the gate. Attached is a detailed map and directions to MCAS – Miramar Officer's Club for your information. All committee members are requested to arrive early (5:00 PM) for set-up. For those who will not be able to make it to the event, you can still support our scholars. MAASD has been supporting scholars from the beginning and have helped many students get their education through our funding. 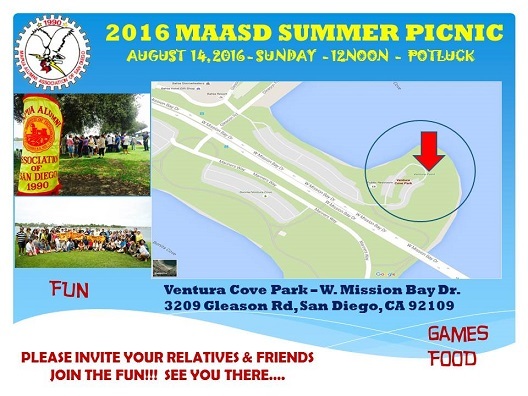 You too can help, by sending a donation of any amount to MAASD treasurer. 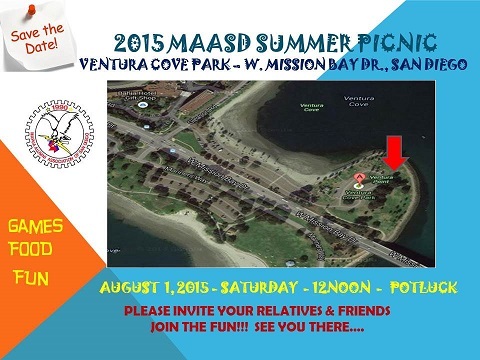 You may send a check payable to “MAASD”, please contact Frank Enriquez (858) 549-8159. Thank you for opening your hearts and your contributions. 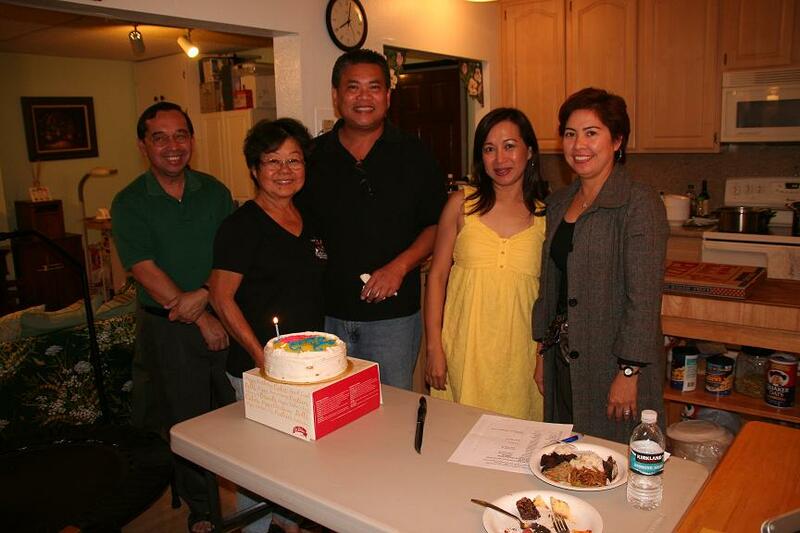 Thanks to Mr. & Mrs. Ernie Rabe for hosting our last meeting on March 22, 2013. 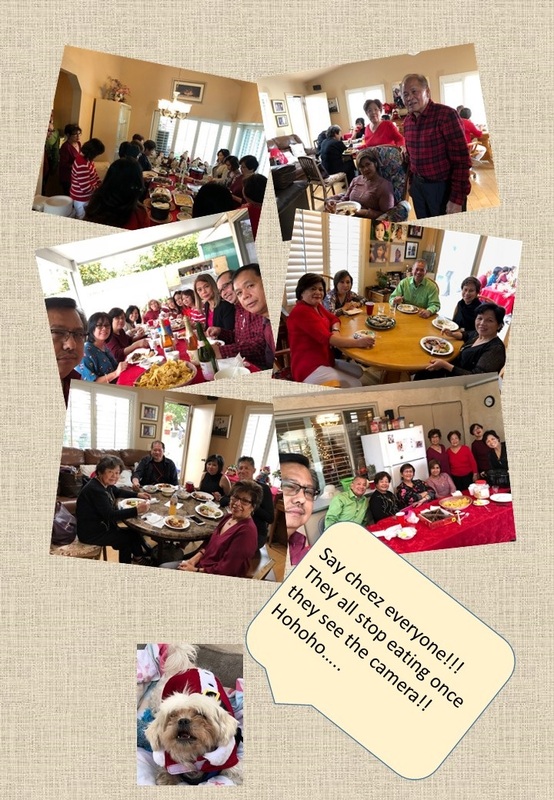 Thank you to Ernie & Edith Rabe, Rod & Rose Alonte, Roy & Jo Villa, Ernie & Fellie Barlahan, Eisen & Myrna Domingo, Hermie & Melinda Samia, Ben & Venny Manuel, Egay & Brenda Inocentes, Mandy & Mildred Reyes, Francis Calimlim, Nando Sumangil, Joy Gacuya, and Tusa Enriquez, for your generous donations. Our event is fast approaching, we need your presence and support. Thanks to Mat & Lucille Malig for hosting our last meeting and of course to all attendees. Don't forget to adjust your watches... DST starts on March 10th. WITH SYMPATHY. It's hard to understand a loss like yours... but hope you know that others are thinking of you, caring about you, and wishing you comfort and peace! Join us for fun, stories, raffle and camaraderie with your fellow MAPUANS! Please bring your favorite dish and drinks to share, bring your family, bring your appetite! MARAMING SALAMAT SA LAHAT by Mandy Reyes Greetings by Mapua Alumni - Happy Mothers Day!